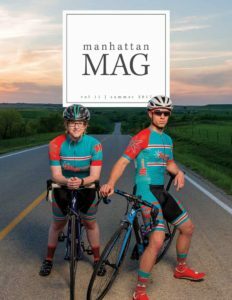 Sunflower Publishing’s self-published regional titles include Manhattan Magazine (above) and Lawrence Magazine (below), as well as Topeka Magazine and Shawnee Magazine. Sunflower’s many custom publishing projects include Laurel Highlands Magazine, KANSAS!, ge magazine, and various pieces for McCain Auditorium at Kansas State University. It was spring of 2017, just shy of the one-year anniversary of our acquisition by a larger publishing company. I sat across the table from our various new directors, reviewing Sunflower Publishing’s business strategy. 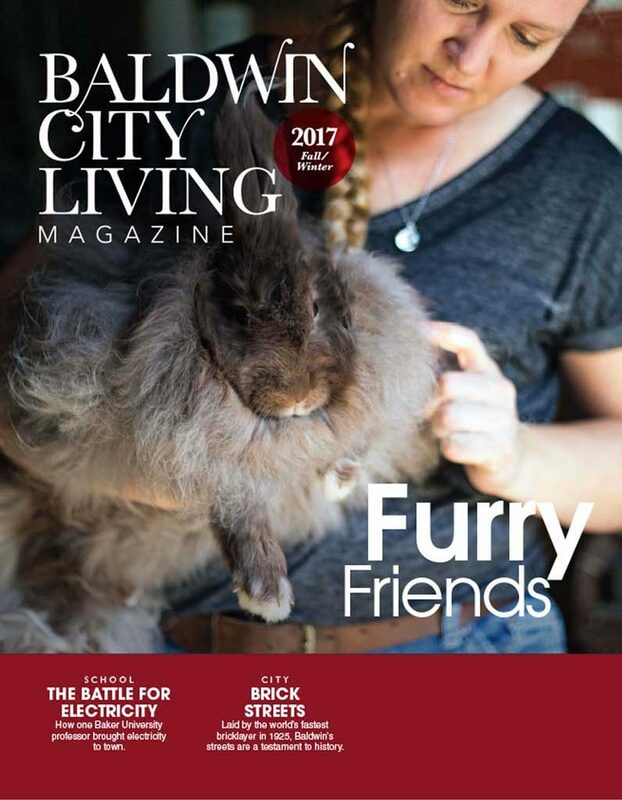 We’re a small city/regional magazine publishing group. Our new owner, Ogden Publications, Inc., is a national consumer magazine publisher. With a pinch of pride, I ran through the many titles we publish, the clients with whom we work, and the seven full-time employees who make up our staff. We were on pace for 67 publishing events for the year. Of that tally, 52 percent was self-published work and 48 percent was custom publishing. We had forecasted over $1.7 million in gross revenue with a near 30 percent profit margin. As I digested my own spoken words, I realized why our new ownership had been so intrigued with Sunflower Publishing: We had created an efficient and profitable approach to city/regional publishing. 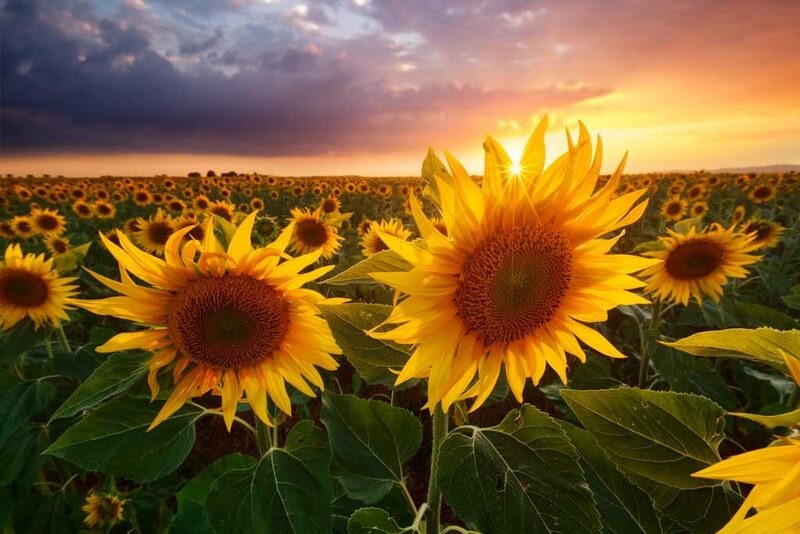 Sunflower Publishing began in 2003 as the magazine publishing division of a 100-year-old, family-owned newspaper company, The World Company, in Lawrence, Kansas. 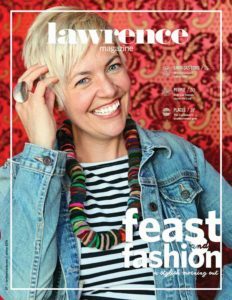 In 2004, we launched our first local city title, Lawrence Magazine. When I started in 2005, I was an intern-turned-editor overseeing Sunflower Publishing’s second magazine, the biannual collegiate publication Chalk, which served the community’s student market. At the time, we were also providing advertising and printing services to a few clients, including the local chamber of commerce and Kansas City Symphony. 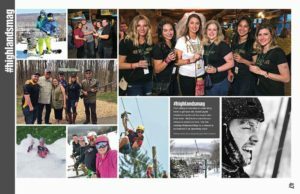 Our magazine division operated independently from the company’s other divisions (newspaper, cable news, and digital), developing our own strategy for growth and sustainability. 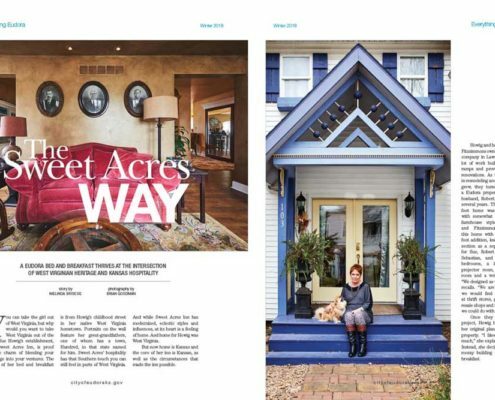 By 2007, business was going so well that we began exploring the launch of new titles — specifically, city magazines in untapped markets across the state. 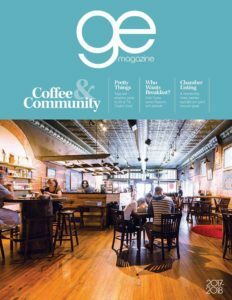 We had seen success with Lawrence Magazine, from increased advertising sales to successful community engagement, and we were confident we could reproduce the same model elsewhere. Our strategy of developing multiple city magazines from one flagship publication was not uncommon among city/regional publishers. It’s a “don’t reinvent the wheel” approach. Use what you have and adapt it to each new community. 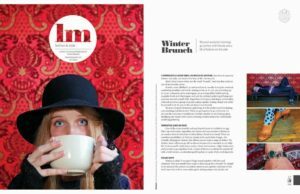 Sunflower Publishing launched five quarterly magazines across Kansas in under three years: Topeka Magazine, Shawnee Magazine, Manhattan Magazine, Hutchinson Magazine, and Sunflower Living. However, the rapid growth was not quite as easy as it sounds. Our team members had to increase their bandwidth; account executives had to double their prospecting efforts; and we had to manage our production schedule with precision. But the hard work paid off as each publication grew to hit record revenues. At its height, Lawrence Magazine sold over $80,000 in advertising per issue. Like all publishers, we didn’t anticipate it. And it’s safe to say we may not have been as ambitious in the number of new launches we pursued had we known what would happen in 2008. When the recession began, the magazine division felt the bleeding almost entirely in advertising. Slowly, our advertising clients decreased the size of their ads, skipped insertions, or pulled out altogether. We spent a lot of time and energy trying to monitor the pulse of our advertising clients and looking for creative ways to keep them engaged. Meanwhile, we tweaked the production values of our magazines to decrease costs. We moved from perfect binding to saddle stitching, replaced our heavier-weight covers with text-stock self-covers, and scaled back on page counts. But as the recession dragged on, it was clear we would need to do more than tweak here and there. We needed a new strategy to maintain our revenue and keep our jobs. Realizing that additional magazine launches would not solve the problem, we began to explore the low-risk opportunities in custom publishing. #1 – We had to diversify our revenue streams. The vast majority of Sunflower Publishing’s revenue had come from print display advertising. While three of our publications sold some subscriptions, the dominant model was controlled and free circulation supported by advertising. Given the impact the recession was having on advertising, there was no choice. We had to find another form of revenue to survive. #2 – We had skills and expertise to offer. Our team was small but talented and nimble. At the time, it consisted of two editors, two graphic designers, two account executives, and one general manager. Like many companies during the recession, we were doing more with less, but because we had skill and passion backed by good processes, we were capable of maintaining existing work while taking on more. We carefully assessed our capabilities to determine what we could sell and deliver to outside clients. #3 – We saw a need for outsourcing. It turns out we weren’t the only staff attempting to do more with less. As various businesses, agencies, and associations managed their way through the recession, they downsized staffs and shrank marketing capacities — and yet these businesses still had a need for publishing. Outsourcing became their go-to solution. One of our early projects, for example, was to design and print the Kansas Quarter Horse Association Buyer’s & Winner’s Guide (a far cry from a city magazine). From the association’s viewpoint, it was more feasible to outsource the project to us than to find the right graphic designer and printer on its own. By the end of 2012, when we started to see the effects of the recession fade, we had serviced 15 clients, generating over $840,000 in gross revenue — accounting for 55 percent of our total revenue that year. We had survived the recession, but perhaps more importantly, we had discovered a long-term strategy for strengthening our business. 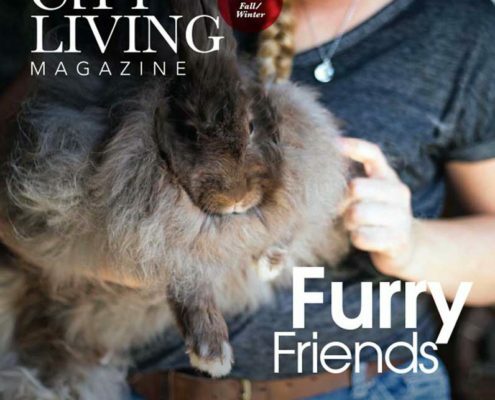 Today, under Ogden Publications, Sunflower Publishing publishes 14 magazines, with frequencies ranging from annual to quarterly, and serves 27 custom publishing clients. The work we do for our outside clients consistently makes up about half of the division’s annual revenue. We see ourselves as the resource for area businesses that need publishing assistance beyond their own capabilities. And in one sense, we aren’t doing anything particularly innovative. We offer to outside clients the core services inherent to any publisher: editorial, design, advertising sales, and print brokering. What is innovative, however, is our approach to creating value for our clients — specifically, a value others can’t match. We’ve done this by learning to leverage the assets we have at our disposal. And I’m not just talking about our staff and capabilities. I’m talking about reach: our magazines and each one’s associated audience. What’s more valuable to publishers and their advertisers than reach? We discovered the potential in this approach with one particular bid process. 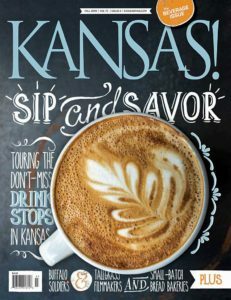 In 2009, we bid on the editorial and design production for KANSAS!, a quarterly travel magazine published by the Kansas Department of Wildlife, Parks, and Tourism that mails to about 25,000 subscribers. Since the Kansas tourism department operates on a relatively small marketing budget, its RFPs consistently request value-added opportunities that might help the state maximize its spend. Prompted by this, we conjured up the following offer: As a Sunflower publishing partner, KANSAS! would receive complimentary advertising space in four of our self-published magazines (Lawrence Magazine, Topeka Magazine, Manhattan Magazine, and Shawnee Magazine), along with readership surveys, a digital edition, and subscription consulting. All at no additional cost, offered in the context of a four-year contract (renewed in 2013 for an additional six years). This package gave the tourism department unparalleled reach, enabling it to promote the state’s attractions to over 50,000 more readers across Kansas. And on top of that, we provided established mechanisms for the state to gauge reader needs and interests, circulate its magazine digitally, and build its subscriber list — all tools that empower the state to further strengthen its reach and effectiveness. We won the KANSAS! contract, but even more importantly, we realized we were onto something. 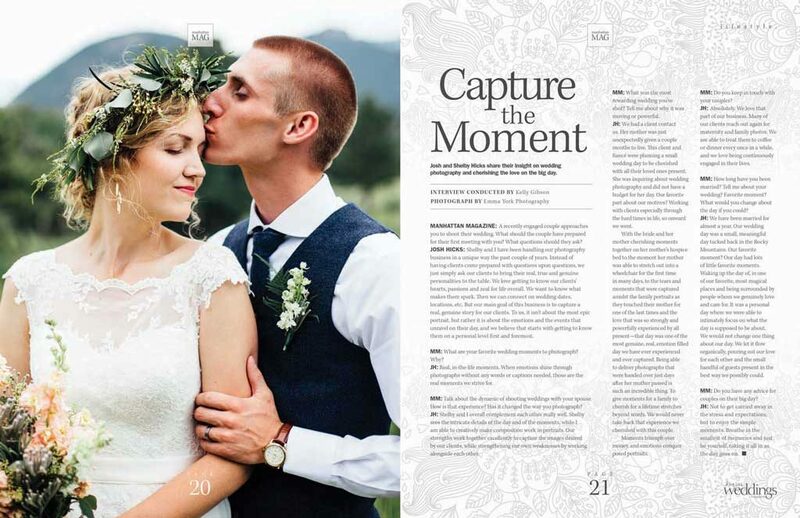 We could leverage our own magazines — and their associated audiences — to provide our custom publishing clients with a unique value that sets us apart. We began to add these options to all of our bid packages with excellent results. 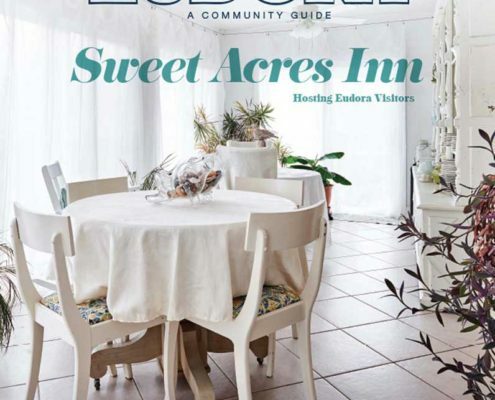 For example, when we bid our four core services for the eXplore Lawrence Visitor Guide in Lawrence, Kansas, we offered an extensive advertising package in all our magazines, which reach a combined 51,350 readers. Other publishers couldn’t compete with this, and we won the project. 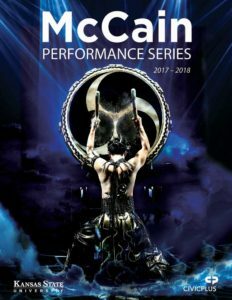 When we bid the pass-through printing services for McCain Auditorium at Kansas State University in Manhattan, Kansas, we offered an advertising package in Manhattan Magazine, which reaches over 11,750 readers. Other printers couldn’t compete. 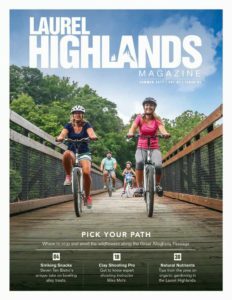 When we bid on printing for the Manhattan Visitor Guide, published by the Manhattan Chamber of Commerce, we offered an advertising package in Lawrence Magazine and Shawnee Magazine, which reach a combined 26,600 readers. Other printers and custom publishers couldn’t compete. Today, as a standard practice, we provide Sunflower Publishing partners with a tailored advertising package to promote their business or products — at zero additional cost. This has been especially appealing to smaller tourism clients who want to reach residents in various communities throughout Kansas. It’s not unheard of for a Sunflower client to receive $15,000 worth of advertising on a $50,000 publishing contract. We have also developed a suite of other value-added offerings that we selectively build into project proposals, depending on the client and the nature of its needs. 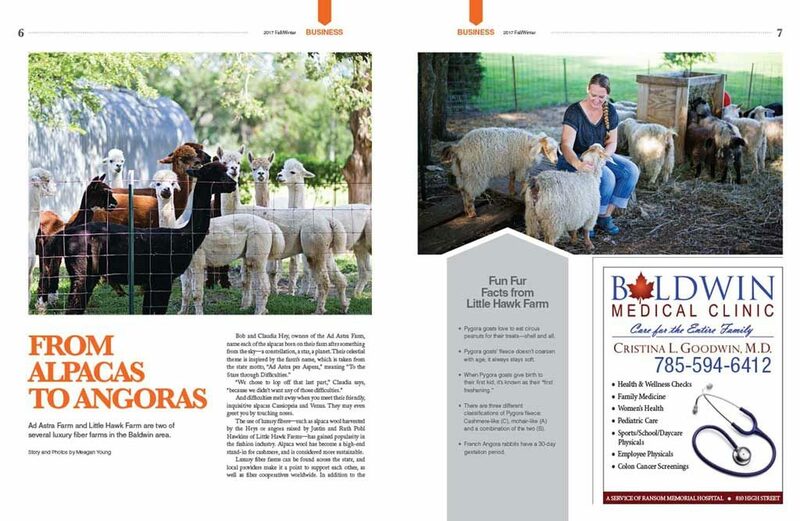 These include advertorials in our magazines, cross promotion on our parent company’s network of newspaper websites, marketing support, social media planning, digital editions, and readership surveys. 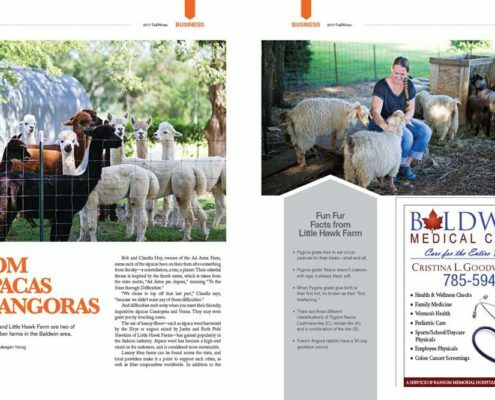 As part of Sunflower Publishing’s custom publishing program, we identify small communities (populations of less than 10,000) throughout Kansas that have a need for a hybrid publication — part magazine, part visitor guide, part chamber directory. The challenge: These communities can’t afford Sunflower Publishing’s full services and have small potential advertising pools. The solution: “The Stakeholder Model.” We invite three entities to invest in each community magazine — typically, the municipality, the chamber of commerce, and the school district. Investment levels vary. Each stakeholder provides advertising prospects, content ideas, and assistance with distribution. In return, they receive either advertising space or coverage in each issue. The markets have small business districts but, as typical of bedroom communities, very active residential engagement. 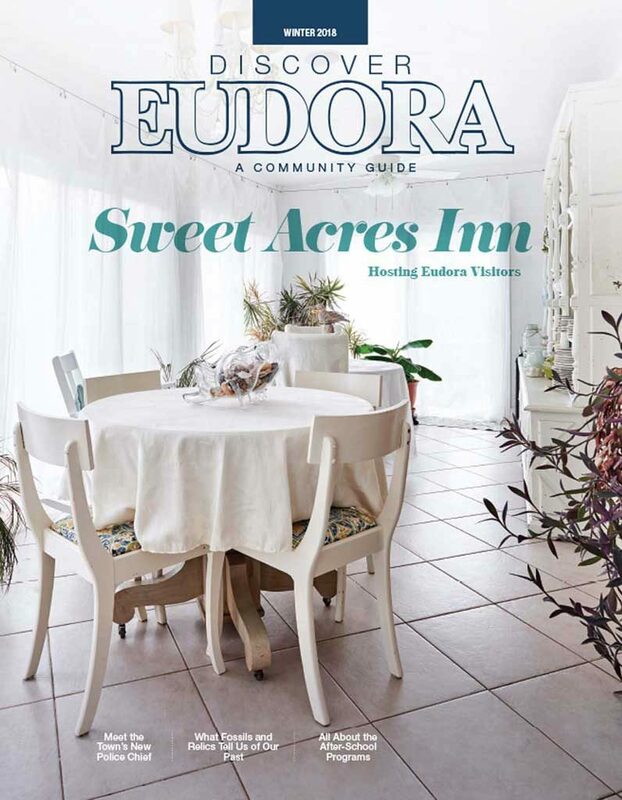 Within each community, the magazines have nurtured loyal followings. The sum of investments covers production and printing expenses. Sunflower Publishing sells advertising and retains the associated revenue. Sunflower owns each magazine, backed by this strong set of stakeholders. In August 2016, Topeka-based Ogden Publications, Inc. — subsidiary of The Ogden Newspapers, Inc. — acquired Sunflower Publishing and the Lawrence Journal-World newspaper. Ogden Publications, Inc. publishes Mother Earth News, Mother Earth Living, Grit, and Motorcycle Classics, among others. The Ogden Newspapers owns and operates over 40 daily and weekly newspapers across the United States. 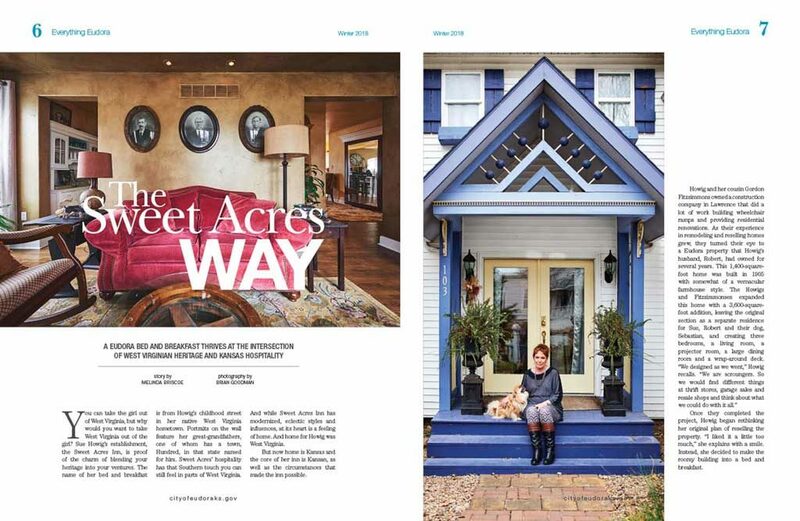 Given our experience with custom publishing, this breadth and reach signaled one thing to us: opportunity. We’re now working to answer that question. It’s not simple. For one thing, newspaper publishers are understandably slow to weigh their options in the current media landscape. But the central idea is this: To create new (or improve existing) regional magazines in partnership with this network of newspaper publishers. The challenge for Sunflower Publishing, as it has been before, is to think outside the box, to figure out how we can leverage what we have (the capabilities, the reach, and the connections) to create compelling value for this distinct set of publishers. And then to do it in a way that sets us apart from any entity with whom we might compete. That is the challenge — and the promise — of custom publishing. Katy Ibsen worked with Sunflower Publishing for over 10 years as editor and then general manager overseeing new business development. Ibsen is now a magazine publishing consultant and freelance writer. Connect at tinyurl.com/linkedin-ibsen.